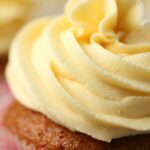 This delicious vegan buttercream frosting is silky, smooth and velvety and perfect to spread on cakes or pipe onto cupcakes. Easy 4-ingredient recipe. Add the powdered sugar, vegan butter, salt and vanilla extract to the bowl of a stand mixer and starting at slow speed, gradually increase speed until thick and smooth. If your consistency is too thick, add a little non-dairy milk a drop at a time, and if it’s too thin, add 1/4 to 1/2 cup more powdered sugar. Spread onto cakes or pipe onto cupcakes. *See our blog post for more troubleshooting tips for this recipe. *This recipe makes enough for 12 cupcakes when piped generously (as pictured) or to frost an 8 or 9-inch two layer cake.